Beachside, Kailua is one of the most desireable neighborhoods on the island for many reasons. The area is excusive but still has a laid back feeling to it. In 1998 experts declared the beach of Kailua Bay as America's finest beach. Geographically, the neighborhood of Beachside includes all the beachfront and 'walk to the beach' properties in Kailua, and therefore has some of the highest property values on the island. The two highest residential property sales reported through the Oahu MLS in the last decade were both beachfront properties located in Beachside, Kailua. Windsurfing and kite boarding are world class in Kailua, and wind surfing pioneer Robby Naish calls Kailua his home,. But perhaps the most telling statement is that the most powerful family in America chooses to take their annual vacations on Kailuana place in Beachside. Yes, The Obamas have rented a beach house in Kailua every Holiday Season since Barrack Obama has been the president, and are they are rumored to be considering buying a home in the area. I look forward to showing you the magic of a moon rise over the Mokulua islands, and negotiating a great price on a property here. Listing courtesy of L. T. Service. Listing courtesy of Devcon Pacific Properties LLC. Courtesy of Hawaii House Inc. Listing courtesy of Hawaii House Inc.. Listing courtesy of Trinity Properties, LLC. 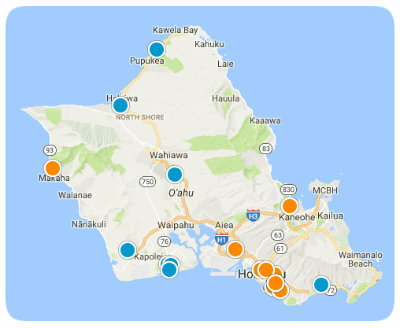 Stay up to date on the Hawaii Real Estate Market!